NETHERLANDS: Ocean surveyors Fugro recorded a 15.7% decline in its revenue for 2017 -- a year it described as "the fourth of an exceptionally deep downturn in oil and gas services". Its revenue fell from €1.78 billion ($2.19 billion) in 2016 to €1.49 billion last year, and its operating profit (Ebitda) dropped from €189.5 million to €100.8 million. Non-oil and gas revenue increased by 9.4% and accounted for 43% of the company’s total revenue in 2017, Fugro stated, but did not provide a breakdown of figures for individual sectors. CEO Paul van Riel said that the company’s solutions were "required to support the energy transition". Last year, the Dutch company secured a contract to investigate two potential US offshore sites for Ørsted. 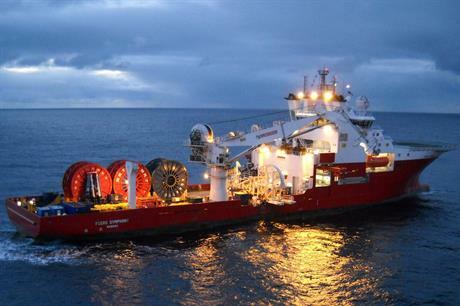 Fugro also sold its marine cable laying and trenching assets to Global Marine Holdings in November, and terminated two long-term charters for construction and installation vessels early, it said. The company stated it now participates in a "more diversified business" following this divestment, and that it now provides wind farm maintenance as a service alongside cable installation. Paul van Riel, Fugro’s CEO, added: "The number of final investment decisions in our offshore oil and gas market is increasing, which is an early indicator of rising activity levels. "Our other markets are expected to grow further as the world economy is strong and our solutions are required to support the energy transition and sustainable urbanisation."